Historic Jeddah, the Gate to Makkah, has been a major port for both tradesmen and pilgrims. It lies on the eastern shore of the Red Sea, at a favourable position for Indian Ocean trade routes especially since the construction of the Suez Canal in the 19th century. Also, over 100,000 pilgrims arrive here yearly for their pilgrimage to Mecca. In the historic town, most of the remaining old buildings date from the 18th and 19th centuries. Notable are the typical Roshan Tower houses and Ribat-s, fortified lodges for merchants and pilgrims. It is interesting to compare the 2011 and 2014 nominations. The former included 3 areas of the city and, in relation to its “pilgrimage” history, ICOMOS concluded that “the impact of pilgrimage to the Holy Cities on Historic Jeddah is therefore relatively recent and today plays a minor role, as the pilgrims disembark at Jeddah International Airport, which is located miles north of the Historic City of Jeddah.”. The common area across the 2 nominations consists of the “central part of the historic city Al Balad”. The 2014 nomination has identified a number of buildings related to the pilgrimage which received NO mention in the 2011 evaluation so, presumably, the nomination file then didn’t major on them either! These are “Ribats” and “Wakalas”. These 2 types of structure have been moved “centre stage” in the nomination – “Wakala” being “large specially constructed buildings” where “richer pilgrims” could rent a room whilst Ribats are “ Fortified buildings built originally for defence but also used for merchants as well as pilgrims.” The problem is that “Although wakala-s are mentioned as part of the justification for OUV, ICOMOS notes that no details are provided in the nomination dossier as to their survival or location.” (Indeed ICOMOS believes that NONE have survived!!) Of Ribats – well there are apparently 3 inside the 2014 inscribed area for which “a program of restoration has been commenced.” –but they are not specified. We visited Jeddah in 2002, spending 1 night there and having a guided morning tour followed by a free afternoon before flying on in the evening to the mountainous south west of the country. It had become an enormous city even then (now 3.5 million people) and the centre had moved away from the Balad area which has also been cut off from the Red Sea by land reclamation. I remember that one of the glossy books for sale about the city was one entirely about its roundabouts (“Traffic circles”)! Jeddah has many of these and has installed art works on each – make a Google search if you are interested further! But Old Jeddah has not survived this enormous expansion of the city without significant losses. Wahabbite beliefs are particularly concerned that “old” things should not be “revered” in any way. If this belief can result in the destruction of early Islamic heritage sites in Mekkah and Medina it is hardly surprising that, for many years, the development of cities like Riyadh and Jeddah has been accompanied by what, at times, has seemed to be a deliberate intention to demolish the old. Against this background it is a fact to be welcomed that other Saudis are opposing this trend and have set up organizations to preserve what is left. But does what is left have OUV? In fact, despite the revised title of the site, the main buildings on display relate more to the trading history of Jeddah than to its role in the Haj. They are all late 19th or early 20th century and the “stars” are the so-called “Tower Houses” or “Roshan” with their “Al-rawasheen” or carved wooden bay windows (Photo). They go up to 7 stories and were constructed by the “Merchant classes” for their own use. When we were there they were all occupied as private houses and we couldn’t go into any of them. Apart from the windows, they were not particularly impressive externally and often had rather tatty local stores occupying the ground floors. Some seemed quite modern with concrete walls around the traditional carved wooden windows –whether these were really authentic “tower houses” or just modern structures adopting the traditional windows in much the same way as a semi in UK might have “Tudor beams” I don’t know. The AB evaluation states “Details of six of these tower houses are provided in the nomination dossier. But ICOMOS notes that it is not stated how many of these tower houses have survived”. Another AB comment is that the best example was destroyed in 1959 during road widening! The only building we did enter was the “Al-Naseef House”. Photos of this are on the Web but amazingly it doesn’t get even a mention in the AB evaluation despite being in the heart of al-Balid. It does have around 7 floors but whether it is strictly a “Tower house” I am not sure – it isn’t purely “traditional” in exterior design. 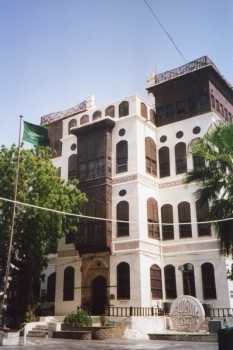 It was built in 1872 by a wealthy merchant and must have been one of the city’s “best residences” when Abdulaziz ibn Saud captured Jeddah in 1925. He used it for some years as a royal residence when he was in Jeddah. In 2002 it was a “museum”. I remember it as “interesting” if not “outstanding” – its richly decorated interior is certainly better than its exterior and shows Turkish and other Middle Eastern influences of the period. It is pleasantly situated in front of a small square with a “historic” tree which, so rare are these, was pointed out to us! The inscribed area is said to have 9 mosques (though ICOMOS notes that no information was provided on 7 of these whilst the other 2 are undergoing major renovations). As non-Muslims we were neither shown nor particularly recognized any. We also neither saw nor were shown any Ribats or Wakalas. What does still remain of course is the old “urban layout” of al-Balid and we spent quite a lot of our free afternoon wandering the narrow twisting streets and up cul de sacs – but, apart from the Roshan areas, these lacked the atmosphere of many “Arabian” townscapes we have visited. Many of the buildings were poorly constructed modern concrete. The main “suqs” are excluded from the inscribed area and the only “shop” I remember gloried in the name of “Everything’s a Riyal!!! As to whether it should be inscribed – well I have no doubt that Saudi Arabia will ensure that the remaining 19th century buildings will be renovated and looked after to the highest standards. As ICOMOS identified, there is a lot of work to do – but Saudi isn’t short of money to do so! The result may not sit entirely comfortably with “western” standards of authenticity but the area does seem worth preserving among the headlong modernization of many Arabian cities even if it is a bit “museumified” in so doing. The site’s title rather misrepresents what is “on show” and the way in which it was inscribed departed from the “official” rigid, and possibly over-academic sequence of “document, preserve, manage and inscribe” by placing “inscription” near the start – as well as exemplifying the “political” workings of the WHC! Those who make it to Saudi Arabia will find aspects, both modern and historic, of much greater interest there than "Historic Jeddah". Ibn Battuta: "Following the pilgrimage of the year 730, I set out from Mecca (God Most High ennoble her) intending to travel to the land of al-Yaman, and came to Juddah [Jeddah], an old town on the sea coast, which is said to have been founded by the Persians."